To many people, the name Kiran Shah doesn't sound familiar. There aren't many people in this world who can say the same! Kiran was born in Kenya, Africa, back in 1958. When he moved to India when he was twelve, he decided to get involved in movies. I had the following interview with Kiran in 2006. Kiran, you have worked with legendary directors like Steven Spielberg, George Lucas, Ridley Scott, Peter Jackson, Jim Henson, James Cameron, Mel Gibson…quite a list! Of all these people who is your personal favorite? And what is your best memory regarding working with these people? In their own way they are all different, they all have different ideas and out look to what they do and the way they approach their subject. I think I am so lucky that I have worked with such directors, also that I have so many memories. In movies like Star Wars and The Dark Crystal, you played characters wearing a mask. In Chronicles of Narnia and Raiders of the Lost Ark, you played human characters without a mask. What do you prefer? A mask or no mask, and has it any influence on how you act? I prefer both with and without mask. An actor is always working with a mask otherwise he is not an actor but himself. To work with a mask means you already have a character, but one has still got to understand about body language and body movement. To work without a mask an actor has to create a mask inside his head and find a characteristic of the character, which will be within his mind while he is playing that character and this will help him to create some sort of body language and body movement for the character. This body language sells the character to his audience. In films like Star Wars and The Dark Crystal the characters are already created with the exterior look but in Raiders Of the Lost Ark I had to create Abu with a certain, simple personality and I had to do the same with Ginarrbrik in The Lion, The Witch and The Wardrobe. I had to base him on a part of my life, in my school days. I went into the past where I used to get bullied and then how I found protection. Ginarrbrik was also bullied from both sides and he found protection from the bad side and he became savage and evil he also worked his way to the top along side the White Witch. Which movie are you most proud of? If you had to name a movie that you want to be remembered for, which one would it be? I am proud of these three movies which are Legend, The Lord of the Rings and The Lion, The Witch and The Wardrobe. You will notice that they all are fantasy movies as they are an excellent escape from reality. This is a difficult question to answer. I think I need to do a few more movies where I can explore characters in depth and then I will be able to answer this question. Of all the characters that you have played during your career, which one is your favorite? To tell you the truth the favorite character that I have played has to be Ginarrbrik. In Return of the Jedi, you were one of the Ewoks. Could you share your memories about the scenes you were in? I played a few different stunt Ewoks. Whenever you see a Ewok swinging, falling, tripping over and getting hit it was one of the stunt Ewoks. There were other stunt Ewoks with me. 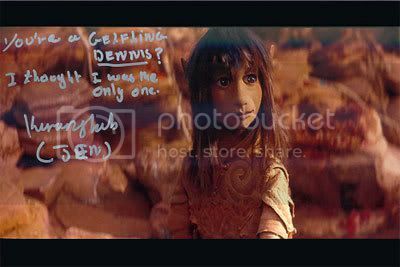 In The Dark Crystal, you played the role of Jen. There were only a few actors in this movie, as it was a puppet-movie; almost everyone was a puppeteer, like Jim Henson and Frank Oz. Was it weird to act in this movie next to all these puppets? They were all puppet characters. We were training for six months and filmed for six months. In the beginning it was funny to see people talking to puppets. Yet, there was a puppeteer who was covered up with his puppet. You can only see the puppet and it was always moving in a way just like a human and one soon forgets that it is a puppet; you end up talking to a puppet and it would answer back. You were in two Indiana Jones movies: Raiders of the Lost Ark and Temple of Doom; in which you did the stunts for Jonathan Quan (Short Round). What was the most dangerous stunt you had to do? Yes, I remember stunt doubling Jonathan Quan when he was just a boy. It was a pleasure to double him and one stunt I remember doing was not dangerous but difficult to do. I had to climb a cave wall in the studio. The walls were made to be wet so it was slippery and on top of that it was cold so to grip the holds was difficult as I kept slipping but still managed to climb up. Even with safety equipment it was still difficult. Heb "The Dark Crystal" nooit gezien. Toch maar snel eens doen!